Marshall Gears started cutting Industrial Gears for the Cement industry way back in 1964, We have evolved in each area of Industrial gear cutting and are today a full service gear manufacturing company providing precision gear products and power transmission services. 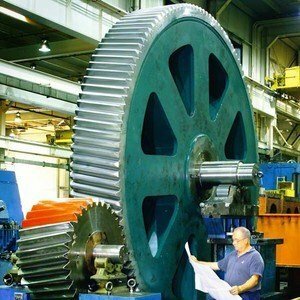 A registered SSI unit, with over 40 years of experience and a reputation for quality, you can count on us to help with all your Gearing needs. We are continuously striving to provide the best quality and service through the use of well equipped equipments and trained professionals. Cement is an essential ingredient in the Construction, Infrastructure, and other core industries that provide the platform to drive growth and progress. The basic raw material used to manufacture cement is Limestone. Hence most of the Cement plants are based near limestone quarries for ready availability of raw material and savings in time and transportation. A Cement plant manufacturers Cement by crushing Limestone through Rollers in Kilns and Mills. These Kiln and Mills are driven by Large Industrial Gears and Pinions and various Gearboxes. After the sugar cane has been chopped and shredded at the Cane Yard, this prepared cane then enters the No.1 mill where the first step begins in the extraction of sugar from the cane. There are five individual sets of mill tandems; each made up of four iron rollers. The cane is crushed twice as it passes through each tandem for a total of ten crushes before it leaves the mill house as bagasse. We manufacture the following Industrial Gears for the Cement Industry. Bull Gears : These are large diameter gears that are between 2000 mm to 4000 mm in diameter and upto 36 Module. Generally made in Cast Iron or Cast Steel. Pinions : Pinions are smaller in diameter and run with Bull gears effectively giving the speed reduction required to drive the rollers in the Mill. Pinions are made of Forged steel, EN-19 , EN-24 are generally used. Gearbox Replacement Gears and Pinions : Various spare gears and pinions are made as per client's requirements. Have a question about your Gear requirement ? Get in touch with us for a quick word of advise. Click here.